Toluna provides consumer insights and research for the on-demand economy. Toluna is transforming the way marketing decisions are made. By connecting businesses and consumers in real-time to deliver insights ‘on-demand’ to companies of all sizes, and provide consumers with the ability to shape the products they use. Powered by the perfect fusion of technology, expertise and community,Toluna offers the only end-to-end platform where audiences, surveys, communities, and analytics are completely integrated with one another and on hand when it matters most. 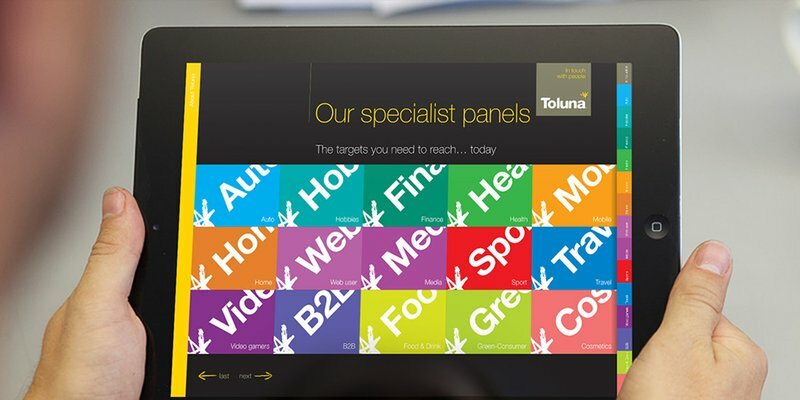 The world’s no.1 online research and insight provider Toluna needed their brand modernised and refreshed to reflect their increasing influence in the global survey technology market. By cleverly characterising fingertips (symbolising panel respondents tapping into online surveys) under the new tagline ‘in touch with people, the visual language and look and feel also represented having human insights and research on hand and at hand. Engaging illustrated characters brought the brand to life in a distinctive approach. Chaos upgraded their old moon logo (to-luna originated from meaning ‘to the moon’) to a contemporary asterisk star instead, elevating the brand to its true status in the market. Following our help with brand activation, guidelines, literature, web and advertising, Toluna has grown by acquisition, integrating the new companies into the brand style.